Spanning wide to tele, the AF-S DX NIKKOR 18-200mm f/3.5-5.6G ED VR II from Nikon is an ideal all-around lens characterized by an advanced optical design, compact profile, and image stabilization. Three aspherical elements and two extra-low dispersion elements are used to control both spherical and chromatic aberrations, in order to produce high sharpness and clarity, and a Super Integrated Coating works to minimize flare for high contrast and color accuracy. Supporting the optics is VR II image stabilization, which compensates for up to 3.5 stops of camera shake to help realize sharp imagery when shooting handheld. A Silent Wave Motor is also used to provide fast and precise autofocus performance, along with full-time manual focus override. All-in-one zoom spans wide-angle to telephoto focal lengths and is designed for Nikon F-mount DX-format cameras, where it provides a 27-300mm equivalent range. 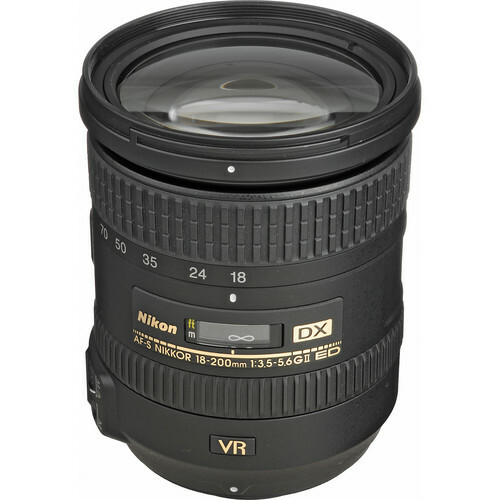 AF-S DX NIKKOR 18-200mm f/3.5-5.6G ED VR II Lens is rated 4.7 out of 5 by 935. Rated 4 out of 5 by jcbpa from Performs Just Like it Should! This is a great all around lens. It is quick to focus and makes an easy carry. Recently took it to Orlando and on my Nikon 300 it did all I expected. It would be wonderful if the f/stop were 2.8, but that would be a bit of stretch. I did find several situations where the 300 and the lens forced me to shoot at higher ISO's than I would prefer, but for the money and the versatility, it is worth having in your camera bag. I could have carried the big 2.8 zoom, but it would have been uncomfortable. Would I use this for super high def quality photos... probably not, but it does perform. Buy it you will not be unhappy. Rated 4 out of 5 by bayareahacker from Excellent all purpose lens I use a D40, an 18-55mm lens, and this 18-200mm lens. The 18-200 is excellent for travelling, hiking, etc., when you don't want to carry a photography shop in your bag and just need an all-purpose lens. It's moderately fast, not too heavy (this is relative...), and the quality is pretty good. The VR helps too -- I sometimes prefer this lens to my 18-55mm non-VR lens even when shooting at 18mm, because of the VR. On the downside there's some pronounced vignetting when zoomed in > 100 mm (even when not using the hood). All things considered, this is a solid purchase, one that I haven't regretted at all inspite of its high price. Rated 4 out of 5 by Popspin 77 from Fantastic traveling lens I replaced my 28mm-200mm Nikon lense with this 18mm -200mm VR lense. On a recent trip overseas I took only this lense leaving my wide angle and real telephoto lenses at home. What a great single walk-around lense...wide angle very good @ 18mm, a big improvement over th previous lense I had. Telephoto good @ 200. The VR really helps the sharpness by compensating for a shaking hand at 200. While not tiny, the size and weight is good for the flexibility and quality of the shots I got with my D7000; both snapshots and video worked very well. (HGX filters help too.) If you plan to travel or don't want to carry around too many lenses this is a great choice. Rated 4 out of 5 by Sailingtennisbum from Very Good Lens for an All in One I purchased this lens after reading the many reviews out there on both the Nikon and other aftermarket lenses. It was purchased primarily for overseas travel when it is simply not practical to travel with alot of gear. So far I have found it to be a very useful lens , great range ,and capable of delivering very good results ....particularly if in the hands of a skilled photographer that understands the limitations of a lens and rarely uses the auto settings on their camera . I use this on a D7000 and have been very satisfied . Fast accurate focus and consistent results. Probably as good as it gets for an all in one lens. Rated 5 out of 5 by PiratePhotographer from 's wonderful I'd wanted this lens for years and now that I have it, it's all I dreamt it would be. Right out of the box it's been a joy to use, although I am still learning of its potential and power. Having used my Nikon D3100 with 18-55mm kit lens for ages, I was already spoiled. Yes, that's what I said: Nikon's entry-level DSLR with kit lens is impressive equipment and it spoiled me. I have a D7000 now but to be honest, I like the 18-200mm on the D3100 better. Takes off a few ounces of weight and just feels right. I'll keep a prime on the D7000 for now. To sum up, you can't go wrong with this wonderful lens. Get it while you can. Rated 4 out of 5 by Halo23 from Still not sure about this purchase! I carefully read all the reviews about this lens before deciding to purchase it after upgrading my camera from the nikon D80 to the D5300. I have previously used the nikkor 70-300 and 55-200 lenses but wanted to try this lens as a replacement to those. I have noticed that if you aren't careful after zooming in to lock focus when pulling back the focus can easily be lost and I have experienced a little creep where many others insisted that didn't. The autofocus is not instant. I would say that for a single subject it works well but when shooting multiple subjects together it loses the quality of sharpness I enjoyed with other lenses. Rated 5 out of 5 by Anonymous from An Absolute Beauty! Wow. This lens is everything that I thought it would be. Whether it's the group picture of hyper teenagers or the close-up of a child's unexpected expression, I am indeed satisfied with depth of the shots I get. I'm FAR from being the pro and I'm well aware that this lens is not the pro's sports lens, but I can even get those football pictures as long as I position myself on the sideline. I don't find it heavy, just solidly made which I appreciate. I just wish someone could have told me a couple of years ago to save my money a bit longer and buy the Nikon 18-200mm VR rather than a cheaper rival. At this time, we are listing this lens as being made in Thailand. Be aware that country of origin can change. Would this lens work for a D600? And if not which telephotos work with a Nikon D600? While the Nikon AF-S DX NIKKOR 18-200mm f/3.5-5.6G ED VR II Zoom Lens will physically attach onto the Nikon D600 DSLR camera, the lens is designed for Nikon cameras that use the smaller APS-C 1.5x cropped DX sensor; the Nikon D600 uses the full-frame FX sensor. As such, if you use the smaller Nikon AF-S DX NIKKOR 18-200mm f/3.5-5.6G ED VR II Zoom Lens on the D600, it would work in Auto DX-Crop Mode and would reduce the camera's resolution from 24MP down to 10 MP. If you need a similar lens that would work for full-frame FX lenses, then the Nikon AF-S NIKKOR 28-300mm f/3.5-5.6G ED VR Zoom Lens, B&amp;H # NI28300GAF, would work for your needs. What is the difference between the 18 to 200 VR vs the VRII? The primary difference between VR and VR II is the zooming mechanism of the VR II, which now features a lock to prevent the zoom from creeping. VR II also features four stop compensation, compared to the original VR's three stop compensation. The image stabilization and sharpness is also improved with VR II. This is a brand new Nikon AF-S DX Nikkkor 18-200 f/3.5-5.6G ED VR II Lens. will this lens work with a D50? Yes. The Nikon AF-S DX NIKKOR 18-200mm f/3.5-5.6G ED VR II Zoom Lens is designed for use with Nikon DSLR cameras that use the APS-C 1.5x DX sensor, which includes the Nikon D50 DSLR camera. 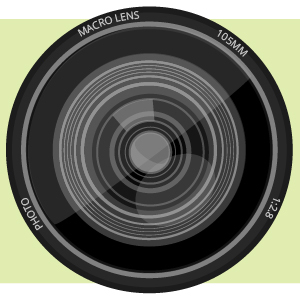 The lens would be fully compatible with the Nikon D50 DSLR camera. is first year international warranty? Yes, the first year of Nikkor lens warranties is international. what is the warranty on this 18-200 Nikon Lens? Will this lens work with a D700 full frame camera? The NIKKOR 18-200mm f/3.5-5.6G ED VR II Zoom Lens is not a full frame len, but a DX model, meaning it is designed to be used on a camera with an APS-C size sensor. DX lenses will work on a D700 or other full frame Nikon camera bodies when programmed to shoot in DX mode, cropping the sensor to an APS-C format.